In order to study the evolution of Eminescu's thinking and to seek the grounds for his proclivity for India, it is necessary to look back to his early writings (1866 to 1869), the year when the poet began his higher studies in Vienna and at the same time serious study of Indian literature. The stylistic perfection of the first published poem, At the Grave of Aron Pumnul, prompts us to believe that it was not Eminescu's first poetical attempt. Nevertheless, for the reasons mentioned above we will start with it. The debut poem is a first success as the writer himself considered. For us it marked the first bloom of Eminescu's genius, his coming out of latency. Remembrances on Eminescu by Stefanelli depict the frame of mind of the poet which bred this poem. The death of Aron Pumnul, his spiritual father, inspired this poem  and in its turn the poem brought the poet consolation, and expiation from pain. The idea that the most beautiful poems are derived from the most melancholy thoughts is universal. And yet this happening in Eminescu's life drew him closer to the Indian poets than to western ones. Legend has it that the maiden verses of Valmiki, the poet of Ramayana, were inspired by compassion for a bird whose mate had been killed by a hunter. This accounts for the opinion that the Sanskrit term sloka (verse) originates in soka (melancholy). A similar happening to that in Eminescu's life is said to have helped Tagore reach maturity of thinking. Although he had made his début in 1874 at 13  and was already known by a few volumes of poetry, he himself confessed that his poetry "reached the threshold of mankind" only in 1886, with the publication of the volume Kadi o koma1, after having gone through all the suffering caused by the death of a close person. As to exterior elements Eminescu's debut poem did not resemble Tagore's above-mentioned book; it was only psychic transformations brought about by a similar suffering that exercised similar influences on the works of both poets. In the preface to a re-published edition of Kadi of komal Tagore mentioned that the basic features like diversity of topics, a tendency towards obectivity, love of life closely related to a strong feeling of death, characteristic of his entire work, were present in that piece for the first time. Eminescu did not leave an autobiography or commentaries about himself yet an analysis of his first poem would clearly seveal several important traits. For example there appear here at least four well-known motifs (of Eminescu), the lucifer star, sorrow and the music of spheres. Also, meditation on life, death and the immortality of the soul which permeate his entire oeuvre and which were to evolve, after thirty years towards his philosophical outlook in The First Epistle. It can be said that At the Grave of Aron Pumnul is an embryo of Eminescu's creation just as Kadi o Komal contains almost all the basic traits of Tagore's creation. In both cases death plays an important role. It helped both poets discover their selves and from that point on the motif of death remained for ever imprinted on their thinking and work. The two images have a counterpart in Bhagavad-gita: "Like a man shedding olden chothes, puts on new ones, thus the embodied one sheds his old body and unites with a new one." (Bhagavad-gita, II, 22) Reminiscences of the Gita philosophy, so vivid in the Indians' minds are natural for Tagore but not so for Eminescu. And yet the idea of the soul's passage from life to immortality, similar to the ideas in Gita is present in his poetry: ... the great genius/... / had embarked upon immortality and left us behind ! (M. Eminescu, Works, I, Ed. Perpessicius, p. 1, verses 10-12). Naturally we cannot invoke here any direct influence of the Indian text: the adolescent's mind reveals only a spiritual closeness to the Indian thinking. The concept of death as a threshold to immortality helps the two poets to overcome pain, to look for happiness in life, in nature. In his autobiography, Jivanasmrti, Tagore remembers that it was the very dynamism of lif e aroused upon his first meeting with death, that instilled in him a joy of livin g and made him aware of the beauty of nature, of the world. Followed the faimous poem Prana (Life) which begins like this: I do not wish to die in this beautiful world. / I want to live among people. Such an elan was not manifest in Eminescu's subsequent verses but neither did the next poem - "If I Had" - ring of melancholy; on the contrary, it exuded a sense of pleasure at being in consonance with nature. The Vaishnavi poetry pertains to the cultivated poetry and folk poetry from Bengal is closely related to it ; Tagore's preoccupation with the latter began perhaps with such imitations. Later on Tagore edited several folk songs, integrating them to his own creation just like Eminescu turned Poplar, Why D'you Swing into a poem called Forest, Why Do You Sway So Low ? The imprint of Vaishnava poetry as well as that of folk poetry is just as manifest with Tagore. The charm in which they enveloped his childhood did not wear away in time; in the contrary it grew stronger. The poet of Git&agrave;njala perceived the beauty of nature and human feelings from the vantage of Vaishnava spirituality, which seeks the infinite in the finite and eternity in time. The place of nature in Tagore's creation is just as important as it is in Eminescu's poetry. In the early poems of the Romanian poet nature appeared under three forms - to create a background, in metaphors of human figures and feelings, and as an all-encompassing background to which man it also integrated. All the elements of the natural background in his maturity poems are present as early as his early creations. The sky, the sun, the moon, the morning star, the night, the stars, the seasons, the clouds, the storm, the blizzard, the snow, the sea, the river, the waves, the resplendence and murmur of the waters, the rustle of the leaves, the woods, the fields, flowers and birds, all mingle together to create a typical Eminescian atmosphere, replete with colours and sounds, expressing the communion and harmonious correspondence between the elements. The images of the moon with Eminescu are sometimes similar to those in Sanskrit lyrics, sometimes they go farther. In Sanskrit literature usually the moon awakens the pains of love. For instance, in Sakuntala, the character called Dushyanta says to himself: "Although I believed that the moon is cool its dew-bathed rays seem to spit fire. The moon torments us, the people in love." (Act III) Such imagery can be found in Eminescu's poem When. Furthermore, the night star also features a different role in Eminescu's creation - the moon's rays carry him to another spiritual realm and reveal the secrets of creation and the futility of life. Eminescu's concept about the moon as a power that revives thoughts and shadows suffering finds a counterpart in the Vedic concept of Varuna, the sky god who watches over human thoughts. (Rig-Veda, VII, 41), a tiny bit of this image is transparent in "The Mysteries of the Night": The while moon's ray / My thoughts turn away / For ever and a day. (Works, I, p. 13, verses 13-15). On Sanskrit rnetaphors Coşbuc punctiliously observed: "The frequent, much too frequent comparisons are very detrimental to Sanskrit lyrics; the eternal comparisons of women to the moon and water lylies are almost unbearable." Kalidasa's skill in conveying a human frame of mind by means of a metaphor drawn from nature (e.g. "I am much like a bee that flutters its wings at night around a closed flower", Sakuntala, Act V)  meant to describe the main character's futile effort to remember the dead woman, did not impress Coşbuc. It did impress Eminescu though. Happiness and pain, quiet and unrest, all sentiments with Emi&not;nescu mingle, melt into one another, in harmony with nature. Eminescu's joy is awakened by association with his native valley, the darkness of the woods that bring peace to him ("From Abroad") and his melancholy is sung "by the wind that cavernously whispers in its chilled flight" ("If I Died or You Died", Works, I. Ed. Perpessicius, 465, 23-24). Noteworthy is the fact that the two outlooks were born intuitively in Eminescu when he was 19 and had not the slightest knowledge of Indian philosophy, which stands proof to the fact that his imagination was akin to the philosophy of India. His concept of love starts from philosophical thinking and evolves in the midsts of nature and art. His first love poem is dedicated to an actress in whom he rather sees a muse than a real person. At that time Eminescu's love was more spiritual. His beloved is either an angel ("Pale Angel") or a chant incarnate ("With an Actress"). His poems of the. time were more readily consecrated to the ideal of love than to a real person. Eros takes a first step instead of the wings and it is a quite daring step indeed. But then the lover and poet changes attitude overnight, returns to the divinization of his beloved and says with "sacred heart," "Today I love you like I love God" (I, 488, 14-16). In a matter of seconds love has turned into devotion. The union of human and divine love is the quintessence of Vaishnava literature to which the poem of mystical love Gitagovinda by Jayadeva, belongs. In Tagore's words the Vaishanava poets saw their beloved in God and God in their beloved. Actually this is Tagore's concept of love. It is interesting to note that the image of death in Eminescu's vision is associated with light. Intuitively, he seems to draw close to the Upanishads poet who saw "The Bright one beyond the darkness" (Svetasvatara Upanishad, III, 8) Not reaching this stage, Eminescu cannot feel this bright experience is encompassing the universe (Ibid. III, 7)  and only by experiencing it can man, the son of immortality, transcend death. (Ibid. III, 8) In other words, the Eminescu of the early poems could not assimilate life and death. All the questions related to human existence bothering Eminescu till that moment are present in Mortua Est ! For the first time a poem of his features the infinite together with eternity. The image of the soul's passing unto eternal life is related to that of passing across the boundaries of the finite: "Thus you have cut across the world's bounds" (Mss 2259, v. 18-20. Works, I. Ed. Perpessicius, 304, r). Uncertainty as to the existence of an after-world ("I do not know whether there is another world after"- Ibid. p. 305, 17) suggests a possible image of the infinite. The concept of the existence of the soul after death is here expressed simply, therefore more clearly and more directly than in the first poem. In several versions of the poem "Mortua est !" written between 1866 and 1871 we find two variants: The soul free from the body and name (Works, I, Ed. Perpessicius, 305, 18) and Your catndid soul amidst the stars I then behold / Whilst here I see the clay, snow-while and cold. (Ibid. p. 309, 17-18). Here the vision is more advanced and closer to Bhadgavd-Gita: "The unborn, eternal, uninterrupted, and ancient is not killed when the body is killed" (Bg. II, 20)  than in the other poems. The several variants of the poem reveal the poet's quest for truth. Sometimes his thinking amounts to really something but for want of a philosophical foundation, that is being unaware of its value, the poet abandons it. In a variant, for instance, there appears the Upanishad idea about death as the return of the beings' lives to the sources of eternal life. This sparkle goes out, quickly replaced by another expression. In a sketch there are present other two Vedic nuances: being and non-being. After so much pondering the poem lapses into a sheer denial of all faiths, ending in revolt: If this has some meaning it's godless and odd ! Upon your wan forehead one cannot read "God"! (Works, I, Ed. Perpessicius, 40, 67-68) The change in attitude meant a contradiction between the poet's ideas. By studying Eminescu's adolescence writing I have come to the conclusion that during those years he had ceaselessly laboured to achieve a philosophical truth about life. He did not, find an answer but all that tormenting bred several questions. After that followed the student years spent in Vienna and then in Berlin where his spiritual universe bent to&not;wards philosophy and then to India. His propensity and soulful yearning pushed Eminescu towards India; Vienna and Berlin were just a happy opportunity. 1 Eminescu M., Works, I, Ed. Perpessicius, Bucharest, 1939, p. 452. 2 Stefanelli, Teodor V., About Eminescu, Bucharest, 1914, p. 43. 3 Mukhopadhyaya, Prabhatakumara, Rabindrajivani, (The Life of Rabindra), vol. I, Calcutta. 1960, p 43. 4 Thakur, Rabindranath, Jivansmrti (Memories about Life), in Rabindra-racanavali (The Works of Rabindra), Ed. Visvabharati, Vol, XVII, Calcutta, 1965, p. 428. 5 Rabindra-racanavali, Ed. Visvabharati, vol. II, Calcutta, 1963, p. 28 (first edition, 1939). 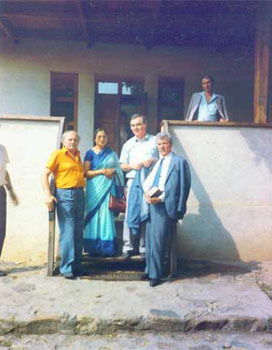 7 Al-George, Sergiu, Filosofia indiană în texte (Indian Philosophy in Texts), Bucharest, 1971, p. 47. 8 Thakur, R., "Jivansmrti", in Rabindra-racanâvali, Vol XVIII, pp. 424-425. 9 Thakur, R., "Kadi o komal," idem, Vol. II, p. 41. 10 Thakur, R., "Jivansmrti", passim. 11 Vianu, Tudor, Poesia lui Emiiiescu (Eminescu's Poetry), Bucharest, 1930, p. 90. 12 Raya, Nihararanjana, Rabindra-sahityer bhumika (Introduction to the Literature of Rabindra), Calcutta, 1962, p. 112. 13 Chiţimia, I. C., "Un element folcloric în creaţia lui Eminescu - Codrul" (A Folklore Element in Eminescu's Work - The Forest), Revista de istorie şi teorie literară, Bucharest, Vol. 13, 1964, No. 2, p. 237. 14 Coşbuc, G., Antologia sanscrită (Sanskrit Anthology), S. E. Demetrian edition, p. XXV (Preface). 16 Sacontala or the Fatal Ring, in The Works of Sir William Jones, vol. IX, p.418. 17. Thakur, R., Raktakaravi, in Rabindra-racanavali, Ed. Visvabhakrishnan, Vol. XV, Calcutta, 1964, p. 367. 18. A Soracebook in Indian Philosophy, S. Radakrishnan and C. A. More ed., Princeton, 1971, p. 17. 19 Coşbuc, G. Ibid. p. XXVI. 20 Sacontala or the Fatal Ring, in The Works of Sir William Jones, vol. IX, p. 471. 21 Tbakur, R., Manasi, in Rabindra-racanavali, vol II, Calcutta, 1963, p. 252. 22 Radhakrishnan, S., Indian Philosophy, London, New York, vol. I, 1971, p. 73. 24 Thakur, R., Sonar Tari (The Golden Boat) in Rabindra-racanavali, ed. Visvabharati, Vol. III, Calcutta, 1964, p. 42. 25 A Sourcebook in Indian Philosophy, p. 24. 26 27, 28, Ibid. p. 90. 29 Al-George, S, Op. cit, p. 46.